To begin this review I’d simply like to say that I am new to this conversation. The conversation that I’m talking about is the conversation about the effects of “globalization” on the Christian faith. More specifically, this conversation is on the effects of the Asian American diaspora on evangelical theology. 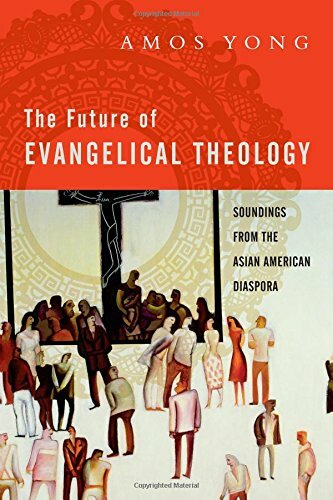 Amos Yong’s book The Future of Evangelical Theology: Soundings from the Asian American Diaspora (henceforth Evangelical Theology) is central to this conversation. At times I felt myself sinking under the number of sources and conversation partners Yong engaged with throughout this work. Much of this could be due to the format of the volume. Many parts of the book reworked essays that Yong had written previously which kept the book from a natural flow (12). That said, even someone new to the conversation like myself can glean much from Yong’s work. Yong begins Evangelical Theology by sharing his “story” with the reader. He explains how growing up in a Pentecostal Chinese American household offered many challenges for him. Issues surrounding identity plagued much of his adolescence. Yong had a seemingly innate desire to know about his Chinese heritage (the culture of his parents) but was told that because he was a Christian he did not need to worry about the cultural aspects of his identity (pgs. 20-21). From this springboard Yong jumps into a number of seemingly disassociated but ultimately united topics. In chapter 1 Yong expands on the realities of globalization and the existing and inevitable expansion of Asian Evangelical Theology. Chapter 2 sets out to speak to the specific experiences in Asian American religious and theological trends. Evangelical Theology really seems to hit its stride in chapter 3. It is here where Yong begins to immerse the reader into the “Whence” and “W(h)ither” of Asian American Evangelical theology. Chapter 4 takes the reader through the specific relationship between Asian American evangelical theology and Pentecostal theology, specifically Asian Pentecostal theology. This leads quite naturally into chapters 5 and 6 which highlight the relationships between evangelical theology, Pentecostal theology and immigration/migration. Then, like chapter 3, chapter 7 offers a somewhat cohesive overview of what Asian American Pent-evangelical theology is and where it’s going all the while echoing back to the themes of globalization in chapter 1. Yong then concludes with an epilogue which takes the form of pseudo-biography much like the prologue. Throughout the book Yong offers a few reoccurring themes. First there is the evangelical response to globalization. Yong perceives the pillars of evangelical theology in America have their heads in the sand in many ways and are devoid of dialogue with the changing nature of the church, particularly in conjunction with the “Asian American Diaspora.” Secondly, Yong considers the impacts that race, ethnicity and culture might have on the gospel. And third, Yong assumes that social, political and economic issues must be addressed by the theology of the church moving forward into an increasingly globalized world. In the end I found Yong’s book stimulating in many ways and am thankful that I have been exposed to a conversation that I was, in many ways, unaware of even taking place. That said, I do disagree with Yong on many levels and sit more comfortably in the theological seats of those who fall under his criticism. As I read Evangelical Theology two questions arose in my mind: (1) Does Yong oversimplify “Evangelicalism” in attempting to show the complexities of the Asian American situation? and (2) Does young take into account the complexities from the “native” side of immigration/migration when attempting to explain the problems of assimilation? I think the questions and conversations that Yong is having are important to the future of evangelical theology and thus I think the title of the book is appropriate. I do not widely recommend this book to everyone but happily recommend it to those who are interested in the intersection between globalization and theology; which inherently entails Asian theology.